Winter walking can take you to some stunning locations and views in Scotland, the Lake District in England and North Wales. As beautiful as winter can be, it is all the more challenging and engrossing because of the potential dangers. But don’t let this statement discourage you, just be well prepared. The freedom you feel being out on the hills, reliant on just yourself is very empowering and fulfilling. 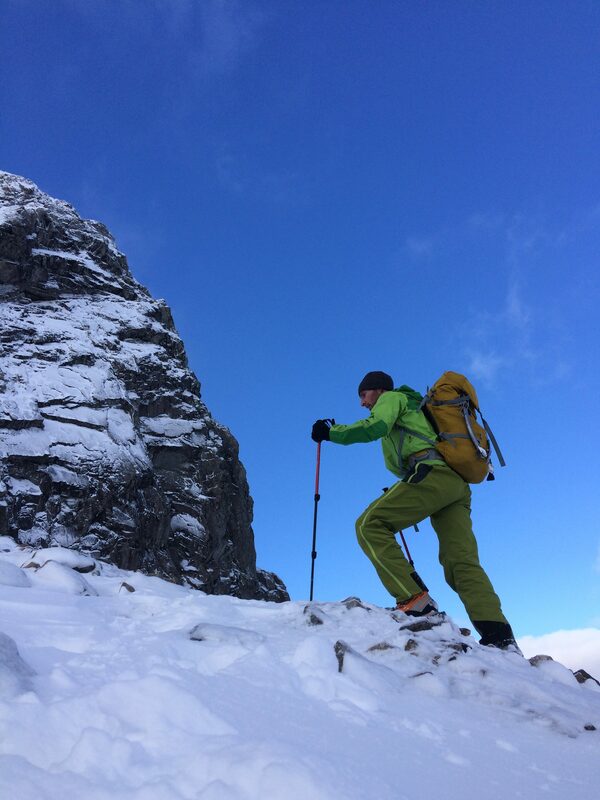 Here we have some winter walking advice, whether you want to bag Munro’s in Scotland, or Furths in Wales or England. Having the right clothes is very important when out in winter. Its about having the right layering system. You need to have warm layers for when it is cold, waterproof layers for when it is windy, raining and/or snowing. It is important to stay warm and dry when out walking in winter without getting too hot, but this can be tricky to do, especially when one does not have much experience. The trick is to wear the right amount of layers, without getting too hot. When you sweat, and it evaporates, it removes heat from the skin. Or when the skin is wet, and you stop creating heat (through movement), the moisture cools very quickly, then the skin, so the body then cools quickly. A day out in the hill when even slightly damp, can feel very miserable. Feeling more like a survival challenge than an enjoyable day out. So if you need to lose a layer, because you can feel your body temperature is rising to the point where you may sweat, please do so. I start cold/cool, and very quickly my body heats up. 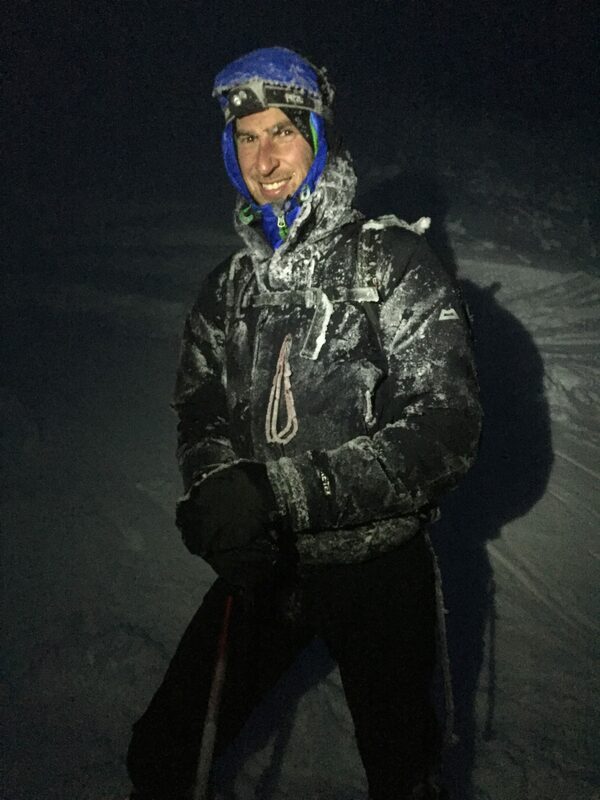 In the right conditions, I have been known to walk in a thermal T-shirt in -20ºC temperatures. Be able to navigate and read a map comfortably in all types of conditions, don’t just rely on electronic devices. GPS and phones can help, but when these stop working, things can go from bad to worse, especially in bad visibility conditions. The battery life of an electronic device can be diminished due to colder temperatures. Or may even sometimes stop working, although they appear to have ½ or 1/3 battery life left. A map and compass will never fail (unless you keep your compass next to your phone, which can cause it to depolarise). It is important to have the ability to walk on bearings, and pace on different types of terrain and snow consistency, as his will give you the freedom to navigate accurately in whiteout and low visibility conditions, as these tend to be a frequent happening in winter. Be able to interpret the weather forecast and avalanche forecast, but be flexible when out on the hill. 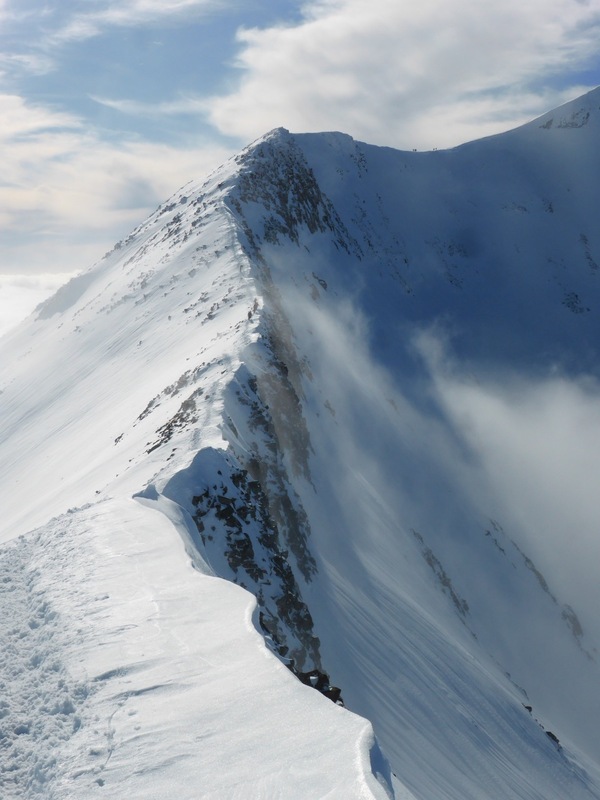 The landscape will have an effect on the wind, and loading or reloading of leeward slope, so an interpretation of the weather and avalanche forecast is essential, but observe conditions when out on the hills, as these can change. The forecasting is fairly accurate nowadays, but it is still a forecast (i.e. a prediction), so observe your surroundings. For further information on avalanche awareness, please click here. 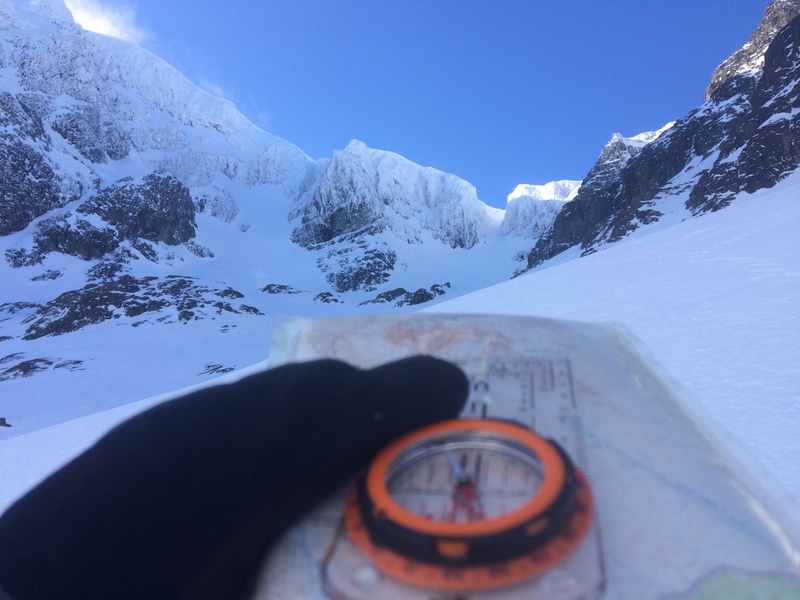 Taking into account the weather and the avalanche forecast, making appropriate plans of which route to follow, but always have a plan A, B, C, etc… And be flexible in your approach. Don’t just follow other people, make your own decisions, and sometimes that gut feeling can be an alarm bell. Having the right kit is essential. A good ice axe of the right length, will give you security on steep ground, the ability to cut steps, the option of building snow anchors, the ability to self-arrest in case of a slip or fall, and in case of an emergency it can be used as a digging tool for a snow shelter. A set of good quality well fitted boots, with a stiff sole and the ability to retain heat are indispensable. Either a B1 or B2 boot, personally I prefer the B2 boot, as these are a little stiffer, and warmer for my feet. But again this is down to personal choice. Crampons come in various flexibilities/rigidities. So for winter walking a C1 or C2 crampon would be advisable. It depends on what other uses you may have for the crampons, and sometimes people want to buy one item which can have multiple purposes. I use a C2 crampon, as I can use these for some technical winter scrambling, which makes these a little more versatile than the C1, which is used only for winter walking or glacier traverses. Make sure that when going out in winter that at least one of you in the group has a comprehensive first aid kit. 99.9% of the time you will not be using it, but you never know what may happen. If something were to happen, you have something you can use till the emergency services arrive (likely to be mountain rescue, if out walking). And always carry an emergency shelter between you as a group. It is very light, and can provide shelter from the weather conditions, even if you are just having lunch. Which can be an emotional relief from the torrent of winds. In the winter months the days are shorter, hence daylight is restricted. So depending on the objective, and the duration of the walk, there is a tendency to start earlier in the day, when it is either dark, or dusk. If the route does not go as planned, or takes longer than initially anticipated, walking back in the dark, a head torch is essential. Especially on the type of terrain, and the potential exposure of terrain than one may be walking on. I could write pages and pages on just gloves, but will try and keep it short. Carry lots of pairs of gloves (I carry 3-4 pairs for walking, don’t always use them all, but rather have warm hands, than having to suffer). I wear a thin pair of gloves on the walk in, or approach. Then put a thicker pair on, when using my ice axe, so as the cold of the metal does not cool my hands. I have a spare pair of thick gloves in case the others get saturated with sweat, or get wet. I then have another thin pair of gloves for the walk out. As the first pair I wore, are probably damp/wet from the morning. Again, this is only a suggestion, and it is a case of trial and error to see what system works for you. The ability to move efficiently with and without crampons over all types of terrain will help you have an enjoyable day. If you are just starting out, plan a slightly shorter day, and shorter walk, and find somewhere with lots of different types of terrain. Once you feel comfortable, just keep pushing those boundaries. Last but not least, remember to have fun. I understand our intention is to have fun, sometimes it may feel like a slog (type 2 fun). If you can follow all of the above, you are more likely to have type 1 fun, with the occasional type 2(**) moment.